Pre-settable Sync and Cross-Mod Effects and Chord Memory. Designed for stunning lead synthesizer sounds as well as polyphonic playing, the new Korg Mono/poly is a 4-VCO computer-controlled synthesizer equipped with an array of advanced, performance-oriented features and effects unavailable in any competing units. 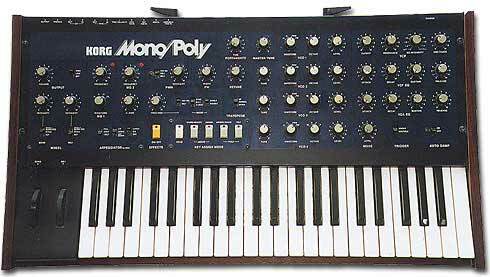 The Korg Mono/poly offers three different Keyboard Assign modes: Unison, for fattest 4-VCO lead sounds; Poly, for 4-note polyphonic capabilities; and Unison/Share which automatically swtiches between Unison and Poly modes by sharing VCOs among the notes played. Also features versatile Hold and Chord Memory functions, which turns intervals and chords into incredible "layered" soloing sounds. The full featured Arpeggiator offers three different patterns, three octave extensions and a unique "Latch" mode which automatically memorizes and sequences chords played at any speed desired. Each VCO features independent Octave, Waveform and Level controls, for ultimate flexibility. The newly developed 24 dB/oct VCF offers continuously variable keyboard tracking (0-150%) and forward/reverse enveloping from its own independent ADSR generator. Two separate Modulation Generators allow the user to set up two modulations at once. Ant the "human engineered" Effects Section features "One-Touch" presettable Sync and Cross-Mod effects, along with Polyphonic Portamento, for the most explosive sounds capabilities. • PORTAMENTO: Time Adjustment .DETUNE: VCO4 (-35 +35) when VCO2 Is (+35.-35) .TRANSPOSE: Up, Normal, Down . • EFFECT: On, Off, Mode (Synchro, Cross-Modulation, Synchro+Cross-Modulation), Connection (Single, Double), Frequency Modulation (VCF EG, MG-1), Frequency Modulation Sensitivity Adjustment, Cross-Modulation sensitivity adjustment. • WEIGHT (H) mm WEIGHT: 1 kg. Prezzo di listino al pubblico anno 1985 da catalogo.